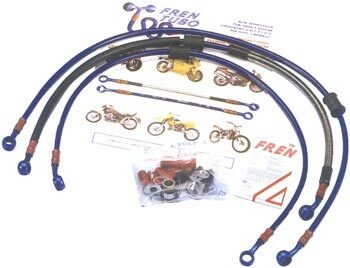 Established in 1984, Fren Tubo is specialized in the production and marketing of high performance tubing for the passage of fluids in the motorcycle field, and particularly in the brakes sector. The size, volumetric expansion and resistance to high stress of Fren Tubo products immediatly gained the interests of experts in the sector. 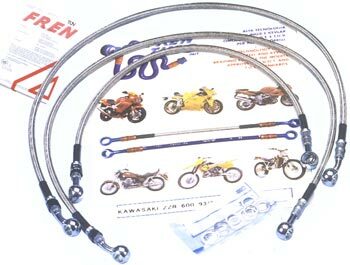 On obtaining DOT and TUV certification in 1988, the stainless-steel brake hose was also adopted as standard equipment. In 1995, the brake hoses with kevlar braiding, characterized by very limited volumetric expansion, were also type-approved by TUV according to the FMVSS 106 standard. The Fren Tubo Quality System has been certified ISO9001 by TUV Italy since October 2000. The brake tubes substitution is adopted generally from him who needs maximum safeness and readiness when braking. Braided hoses eliminate the rubber effect of the original hoses thanks to the reduced volumetric expansion, impeding the pressure of the braking system to be dispersed on the hoses, giving a most direct action on the brake pads, and enhancing the braking power. Steel hose (transparent sleeve) with stell fittings. Kit includes front and rear hoses and everything you need for a correct installation (only if expected) . The brake tubes substitution is adopted generally from him who needs maximum safeness and readiness when braking. Braided hoses eliminate the rubber effect of the original hoses thanks to the reduced volumetric expansion, impeding the pressure of the braking system to be dispersed on the hoses, giving a most direct action on the brake pads, and enhancing the braking power. Steel hose (transparent sleeve) with aluminium alloy fittings. 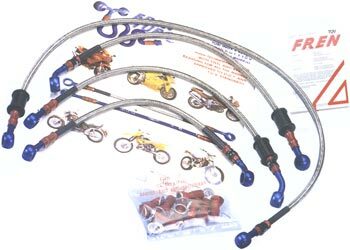 Kit includes front and rear hoses and everything you need for a correct installation (only if expected) . The brake tubes substitution is adopted generally from him who needs maximum safeness and readiness when braking. Braided hoses eliminate the rubber effect of the original hoses thanks to the reduced volumetric expansion, impeding the pressure of the braking system to be dispersed on the hoses, giving a most direct action on the brake pads, and enhancing the braking power. Kevlar hose (usually blue sleeve) with aluminium alloy fittings. Kit includes front and rear hoses and everything you need for a correct installation (only if expected) . - NOMINAL INSIDE DIAM. 1/8"